Katie Bouman was a PhD student in computer science and artificial intelligence at the Massachusetts Institute of Technology (MIT) when, three years ago, she led the creation of an algorithm that would eventually lead to an image of a super-massive black hole at the heart of the Messier 87 galaxy, some 55m light years from Earth, being captured for the first time. 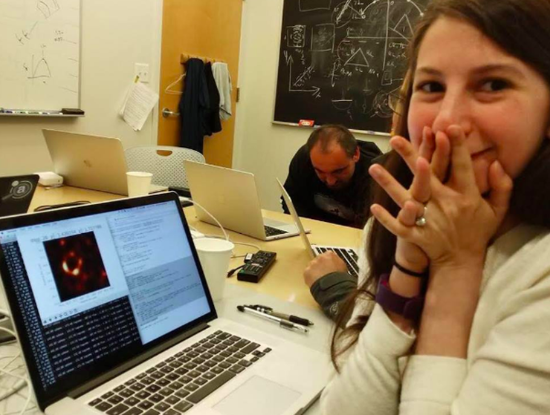 Bouman was among a team of 200 researchers who contributed to the breakthrough, but on Wednesday, a picture of her triumphantly beaming as the image of the black hole materialised on her computer screen went viral, with many determined that Boumans indispensable role was not written out of history as so often has been the case for female scientists and researchers. The data used to piece together the image was captured by the Event Horizon telescope (EHT), a network of eight radio telescopes spanning locations from Antarctica to Spain and Chile. Boumans role, when she joined the team working on the project six years ago as a 23-year-old junior researcher, was to help build an algorithm which could construct the masses of astronomical data collected by the telescope into a single coherent image. With just the press of a button, a fuzzy orange ring appeared on Boumans computer screen, the worlds first image of a super-massive black hole, and astronomical history was made. In a post on social media, Bouman emphasized the collaborative efforts that had made the imaging of the black hole possible. No one algorithm or person made this image, it required the amazing talent of a team of scientists from around the globe and years of hard work to develop the instrument, data processing, imaging methods, and analysis techniques that were necessary to pull off this seemingly impossible feat, said Bouman. While their discovery was made in June, it was only presented to the world by all 200 researchers on Wednesday. Speaking in a 2016 TED talk, Bouman said: Id like to encourage all of you to go out and help push the boundaries of science, even if it may at first seem as mysterious to you as a black hole.